“King King” is getting the deluxe packaging treatment for its 20th anniversary after all, thanks to Dutch boutique label Music On Vinyl. 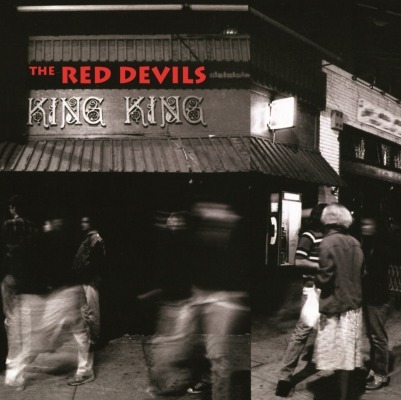 This marks the first time The Red Devils’ “King King” has been released on vinyl and, apparently, Music On Vinyl is giving the record the reissue treatment it deserves. Their only full length album, ‘King King’ is seen as a true Blues classic and Music On Vinyl is honoured to release this album on vinyl for the very first time. To celebrate its 20th anniversary, we decided to do something special: the first 1,000 copies of this double gatefold sleeve album are on bright red vinyl! • First time on vinyl ! The official release date is Feb. 20, but the album is apparently available in some independent record stores in Holland. Music On Vinyl also posted a pic of the limited edition red vinyl at the pressing plant. Unfortunately, it appears Music on Vinyl does not sell individual orders, but rather distributes to record stores only. The album does appear to be available for order at www.kroese-online.nl. And, of course, the album is seeing a reissue on CD as well — also as an import-only. This entry was posted on February 18, 2012 at 11:58 pm and is filed under red devils with tags king king, music on vinyl, red devils, this way up. You can follow any responses to this entry through the RSS 2.0 feed. You can leave a response, or trackback from your own site. I was SO hoping for extra tracks, but the vinyl is very interesting nonetheless. It’s a beautiful release! Bought mine two days ago in a Dutch Record Store here in Holland. Music Vinyl has put a lot of thought into the release. I’ll see if I can send some pics of it to NoFighting. How wonderful that such an exotic thing can be produced in these austere times. I hope that anyone who does buy it enjoys it to the max! Lester & The Red Devils @ King King, My Favorite Monday Party!!!! Monday Nights We’re Off The Hook!! !